My chest has improved tremendously over the last 6 months and below I will describe what I have finalized as my most effective chest building routine. Most of what I am going to describe below is based off of my own anecdotal experiences. I cannot guarantee this will work wonders for you, but it is worth giving a shot. First let&apos;s look at the anatomy of the chest. The pectoralis major is the large fan-shaped muscle covering the anterior rib cage. Some people are confused about this muscle as they believe there is an "outer" and "inner" pectoralis muscle. This classification is anatomically incorrect. But there is an "upper" and "lower" portion of the pectoralis major. The larger sternal head of the pectoralis major, which originates from the sternum, is the "lower" portion of the pectoralis major and the smaller clavicular head, which originates from the clavicle, is the "upper" portion. This separation is anatomically correct since each of these two heads has a distinct action. Both heads insert on the lateral lip of the intertubercular groove on the humerus. 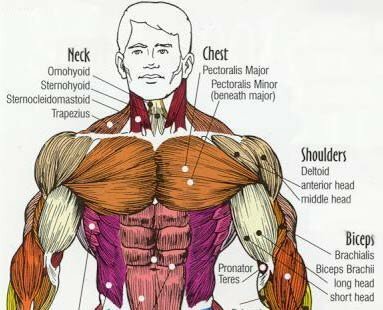 The action of the pectoralis major as a whole (both heads working together) is to adduct the arm and bring it medially across the chest (like when you are hugging someone) as well as medially rotate the arm. The clavicular head flexes the arm and the sternal head extends it. Extension of the arm by the sternal head can only occur if the arm is flexed; the sternal head cannot hyperextend the arm. The pectoralis minor is a small, triangular muscle, which lies deep to the pectoralis major. It originates from the anterior surface of the 3-5 ribs and inserts on the coracoid process of the scapula. The pectoralis minor&apos;s actions include depression and downward rotation of the scapula. I never really focused on bench press until this past year. Everyone always said, "If your chest won&apos;t grow, focus on dumbbell presses." Well I did that and still did not see the progress I would have liked. I began bench pressing in the 3-5 rep range and suddenly my chest started to grow. Why? Because I was pressing much more weight than I could when using dumbbells. I also started to use a little wider grip than before, which helps to increase the recruitment of my chest while decreasing the recruitment of my deltoids and triceps. This simple change in grip width completely changed the stimulus I received from bench pressing. I had actually only changed my grip because my left elbow was bothering me when I used my grip width I normally did. So I widened it and BOOM, my chest loved it. 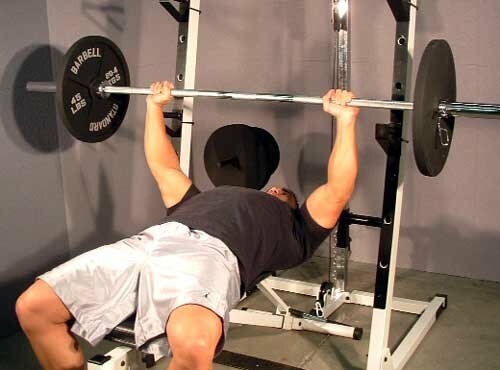 Heavy bench pressing is IMO vital for building a massive chest. The question my clients ask me the most is "when should I increase the weight for the exercise?" I do not increase the weight on my bench press until I complete 3 sets of 5 reps for two consecutive workouts. For example, today I benched 365 for 3 sets of 3 reps.
Once I can bench 365 for 3 sets of 5 reps on two consecutive workouts, I will increase the weight to 375. The reason I wait until I can complete the given reps during two workouts instead of just one workout is it pretty much ensures consistent progress. In the past when I would increase the weight I used more frequently, I would often get stuck at a weight for weeks. For example, when I was trying to work my way up to 315 for 3 sets of 3 reps, I was increasing the weight I used when I could complete the first set of 5 reps, the second set of 4 reps, and the first set of 3 reps. I was aiming for 3-5 reps, so when I could complete all sets as just stated, I upped my weight. While doing this I had a hard time progressing. Not progressing for weeks can be disheartening and frustrating. Thus far, this method of weight progression, waiting until I complete 3 sets of 5 reps for two consecutive workouts, has worked well. 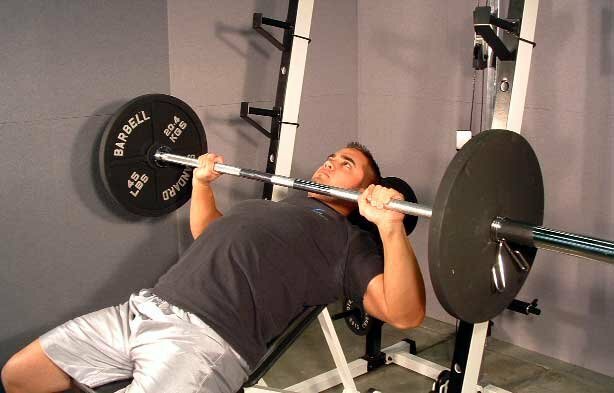 The incline bench press targets the often underdeveloped clavicular head of the pecs. Some may feel that you cannot really target the clavicular head of the pecs, but the difference in the origin (sternum vs. clavicle) of the muscle fibers makes it possible. 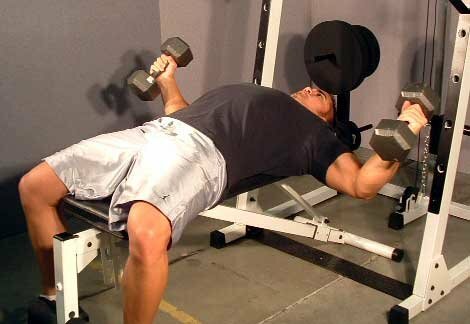 When doing incline bench, you should lower the bar to the top of your clavicle and really focus on pushing your chest up and stretching your pecs. 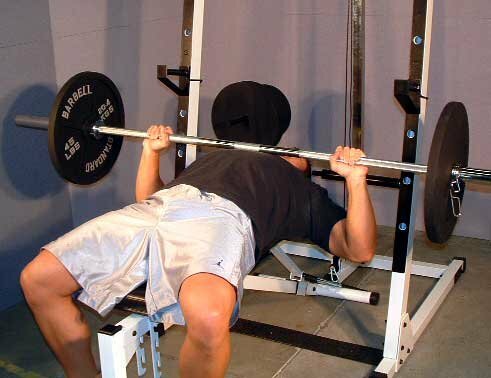 One thing that I have found to help the development of my upper chest is to pause (I pause for 3 seconds) when you are in the fully stretched position, but not resting the bar on your chest. This isometric contraction targets the clavicular fibers and allows you to fully recruit them. During the concentric portion of the lift, you want to focus on using the clavicular fibers of the pecs and not your deltoids or triceps. In order to fully accomplish this, I would recommend using a lighter load than you would normally press. Say you can normally do 225 lbs for 6 reps. Drop the weight down to 185 lbs, go for 6 reps, and really focus on the execution of each rep and add in the isometric pause. 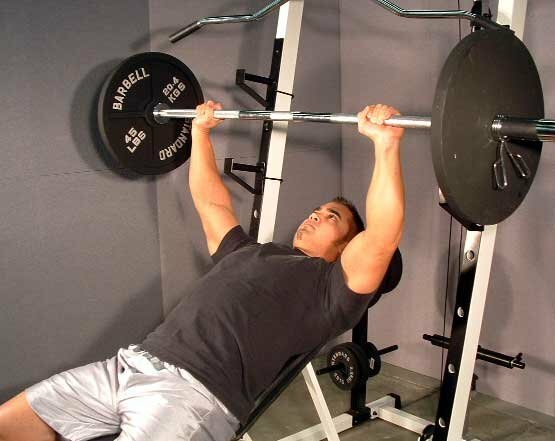 Unlike bench press where the goal is to use a heavy load and to stimulate the entire chest, incline bench presses focuses on targeting the clavicular fibers of the chest, which are often hard for people to train correctly. The final exercise for this routine is DB flies, cable flies, or cable crossovers. If you choose to do DB or cable flies, I recommend doing 1-2 sets of flat flies, 1-2 sets of incline flies, and 1-2 sets of decline. If you choose to do cable crossovers, I recommend doing 1-2 sets of high pulley crossovers, 1-2 sets with the pulleys set at shoulder height, and 1-2 sets of low-pulley crossovers. 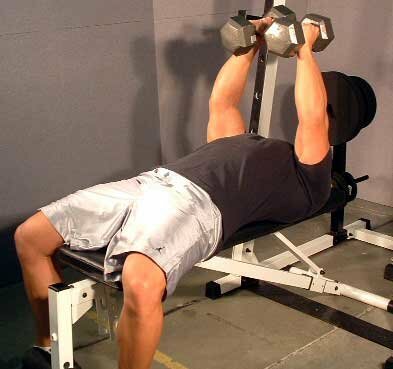 I do not like the term "shaping exercise," so I will just say this setup allows you to hit the pecs for all angles. These exercises allow you to fully bring your arms medially across your body, leading to a hard contraction of the pecs. These isolation exercises are done in a higher rep range as ROM and a solid contraction are of prime importance. From Derek Charlebois&apos; 2006 Competition Journal. Well there is the routine. Try it if you would like. If you want to send me questions or feedback, I can be reached at Derek@scivation.com.